Raise awareness on hunger and need for education or mobilise resources or write blogs or simply pick up an activity close to your heart to support us. Volunteer with us. Sometimes even though we feel for a cause and want to be a part of the solution, our day to day work holds us back. At the end of the day we convince ourselves saying ‘I would have done my bit if I had time’. Forward the mailers to your friends and help us spread the word across. Promote Akshaya Patra in your social networking profile and ask your friends to follow us. Introduce Akshaya Patra to all your online communities/ fan clubs etc. Download and use our screensavers, buttons, posters, wallpapers, banners etc. If you are a blogger, write about Akshaya Patra in your blog and let people know that you support the cause. You can also write what you feel about Akshaya Patra and the cause we work for and send it to us. We will publish it in our blog. 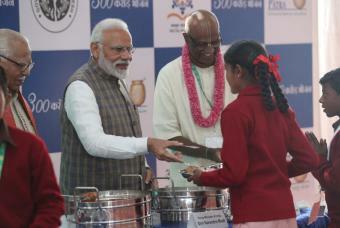 Akshaya Patra feeds 1.76 million children every day across 12 states and 43 kitchens. We also plan to expand our operations to more and more locations. People across the globe are helping us raise this fund in their own small ways. Register yourself as an online fund raising volunteer. Fund raised will go to providing mid-day meal to the school children. Dedicated fundraisers are acknowledged for their efforts on select collaterals of Akshaya Patra. You can become a social media volunteer for Akshaya Patra depending on which Social Media site you are more active. Become our fan on Facebook and regularly like our post and share with your friends. You can be active in all or in any of these activities. Your effort will be acknowledged by us on our Face book page. Besides the above-given options, if you feel you can support Akshaya Patra in some other way being in line with the objective of the organisation, we would like to hear from you.